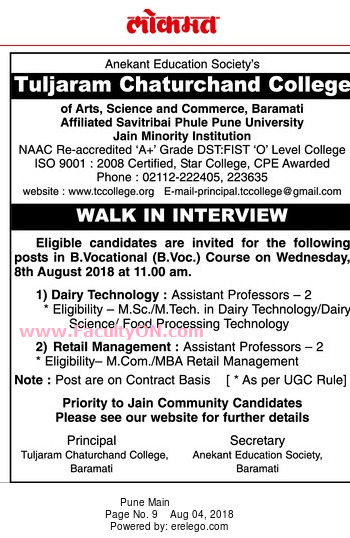 Tuljaram Chaturchand College of Arts Science and Commerce, Baramati has advertised in the LOKMAT newspaper for the recruitment of Assistant Professor jobs vacancies. Interested and eligible job aspirants are requested to walk-in on 08th August 2018. Check out further more details below. About College: Tuljaram Chaturchand College is the oldest and premier reputed institution in Higher Education at Baramati, Dist.Pune, India.This college offers Bachelors’ degrees after successfully completing junior college in the three streams – Arts, Commerce and Science for graduation as well as post graduation. This college is spread over fourty acres of beautiful sylvan surroundings encompassing institutions, catering to the academic needs of over six thousand students aspiring for Higher Education.